The structure depends upon the suspending wire, which is threaded through the needle, and secured by passing the tip of the needle through a knot in the end of the wire. 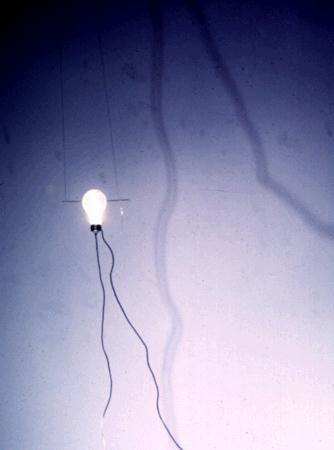 Suspended in space, the light exists as a point on the circuit, which is made more three-dimensional by the split plug. The cords are of different lengths: one 10 foot length contacts the center of the bulb housing, the other wraps around the housing, terminating at 31.4 feet. I proposed the piece initially as part of a series of works, sharp objects when I applied for a City of Winnipeg Grant, which was awarded in late 1995. I made this piece while living in NYC in 1996. Technically, it was difficult to make, and I wasn't sure if the "2 outlet" structure was possible without re-wiring an exhibition space. (it is!) It has been displayed (semi-publicly) in the exhibition case of the Art+Technology department, on the 4th floor of the School of the Art Institute of Chicago, mid-February to April 1998.